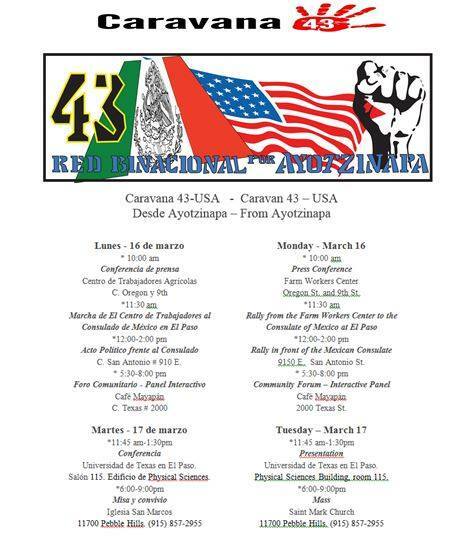 A group representing the parents of the 43 students kidnapped in late September in Guerrero, Mexico will visit El Paso on Monday, March 16 and Tuesday, March 17 to speak to about their children’s experiences and about the human rights violations occurring in Mexico. “The invitation of people of the United States to share our struggle is very timely since our plan is to travel to Central and South America and to Europe from where we have already received more invitations,” said Felipe de la Cruz Sandoval, a representative of the Ayotzinapa group. “It is important that both citizens and government leaders of other countries are aware of the injustices in Mexico and the international community see what is the globalization of repression,” concluded Mr. Sandoval. The parents plan to take their case to the Inter-American Commission, Amnesty International and the United Nations. Organizers of the national caravan hope that the parents’ presentations will not only educate the American people about the human rights violations taking place in Mexico, but also lead American citizens and representatives to consider the hundreds of millions of dollars that the United States provides to Mexico through Plan Mérida for military equipment which has been used by the army and the police against Mexican citizens in violation of their rights. While in El Paso the parents of the kidnap victims are being hosted by La Red Binacional Por Ayotzinapa, a local coalition made up of organizations from El Paso and Ciudad Juárez.